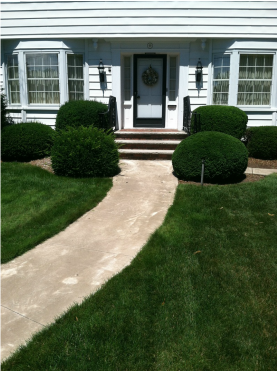 Keeping up the latest lawn and landscaping innovations allows us to provide our clients the information needed to help them achieve a beautiful and inviting landscape. Bed Edging is $0.75 per foot. If you are a mowing customer, and sign up for bed edging for the season , the charge per foot is reduced to $0.50 per foot. Pruning of ornamental shrubs, bushes, and evergreens will be pruned or sheared at proper times to ensure a professionally maintained appearance. Estimate required. We can maintain your flower beds and borders to the highest standard by weeding, deadheading and dividing your current plants, and installing new annuals and perennials. Estimate Required. We pride ourselves on providing clients with the highest quality natural mulch, dyed and natural in color. Interested clients have the opportunity to view their mulch choices at the initial property assessment. Topsoil and Seeding: Smaller repairs to ruts, holes and bare-spots are quick and affordable.